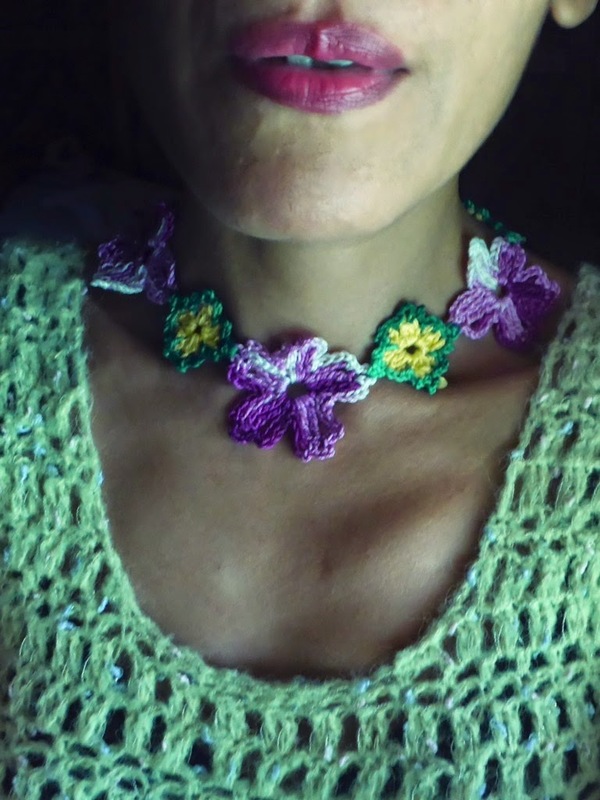 Lapixelat is a crocheted necklace made up of crocheted flowers joined at the last round. 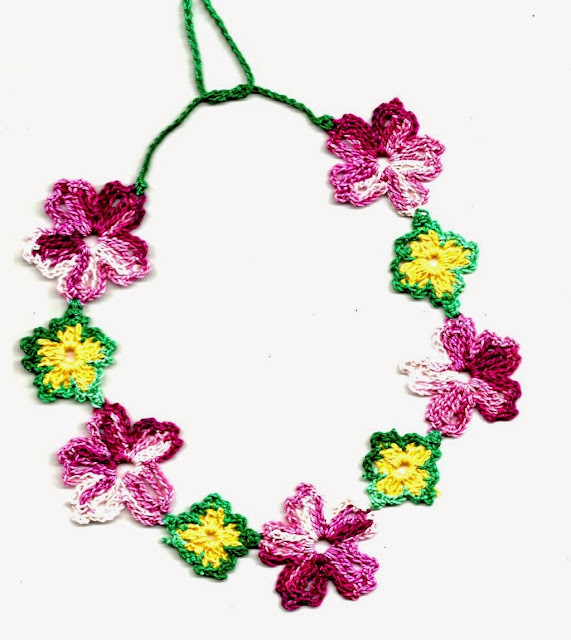 The flowers are joined at the tips of petal with 2 single crochet stitches. 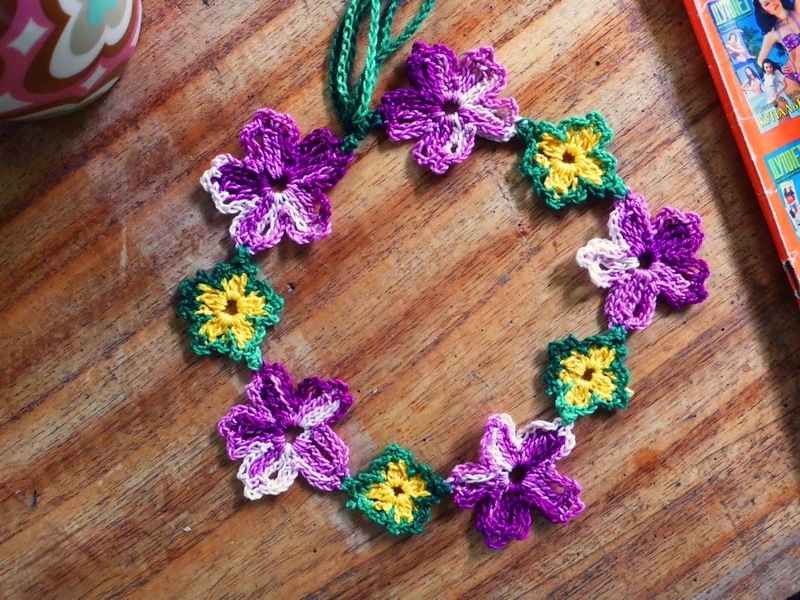 Multicolour yarns of complimentary colours (such as violet and yellow) are used. Be sure to starch your crocheted necklace to keep the flowers from folding over and to protect the necklace from dust and dirt. The crocheted flowers in this necklace are based on the motifs found in the Swimsuit issue of the crochet fashion magazine from the Ukraine, Duplet. 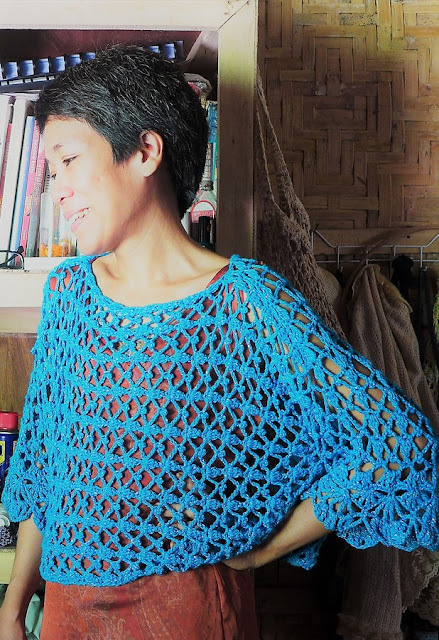 If you can make the motifs and join them, then you should be able to make more motifs of different types and join them to make a larger piece of fabric and make small garment (like a bikini) or a larger one (like a blouse, skirt of dress). Double Treble (dtr): Yarn over the hook (yo) 3 times and insert the hook in stitch, yo and pull loop through, yo and pull through two loops on hook, repeat until you have only one loop on hook. Dtr completed. 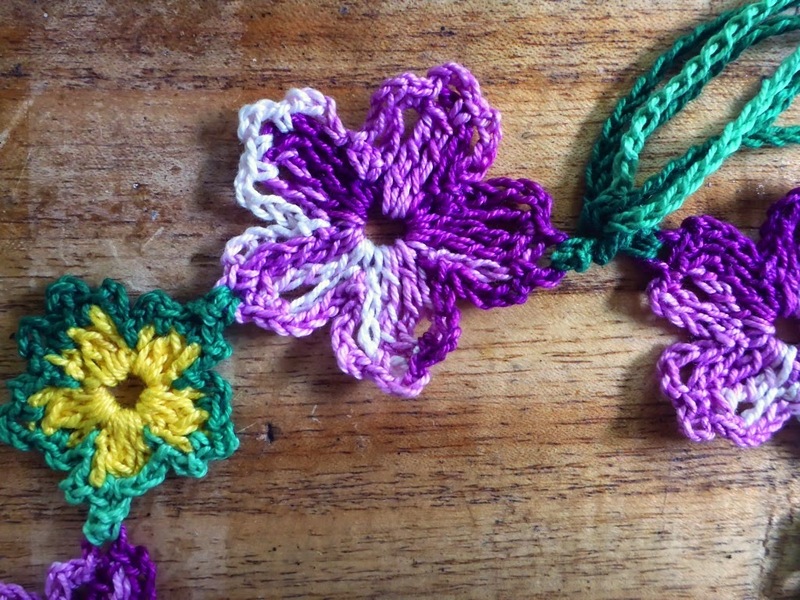 Two Double Treble Together (2 dtr-tog): Keeping last loop of each sc on hook, make a dtr in stitch indicated. Yo and draw through all loops on hook. Two Double Crochet Together (2 dc-tog): Keeping last loop of each sc on hook, make a dc in stitch indicated. Yo and draw through all loops on hook. With violet multicolour thread ch 8, sl st in first ch to make a ring. Rnd 1: Ch 1, sc in ring, *ch 5, 2 dtr-tog in ring, ch 5, sc in ring, rep fr * to make 5 petals; end with sl st in first sc to join. Rnd 2: *Ch 5, sc in 5-ch sp, ch 3, sc in top of 2-dtr-tog, sc in next 5-ch sp, ch 5, sl st in next sc; rep fr * on all petals, ending with sl st in first st to join. Fasten off. With yellow thread ch 6, sl st in first ch to make ring. Rnd 1: Ch 1, sc in ring, *ch 3, 2 dc-tog in ring, ch 3, sc in ring, rep fr * to make 4 petals; end with sl st in first sc to join. Fasten off. Rnd 2 (This rnd joins the large flowers): Join green thread to sc at base of petal; *ch 3, sc in 3-ch sp, ch 1, 2 sc in 3-ch loop at tip of petal of large flower), ch 1, sc in top of 2-dc-tog, sc in next 3-ch sp, ch 3, sl st in next sc; ch 3, sc in next 3-ch sp, ch 3, sc in top of 2-dc-tog, sc in next 3-ch sp, ch 3, sl st in next sc; rep fr * to join to next large flower; end with sl st in first st to join. Fasten off. Join Small Flowers alternating with Large Flowers. Refer to photo for guide (below) as to which petals to join. 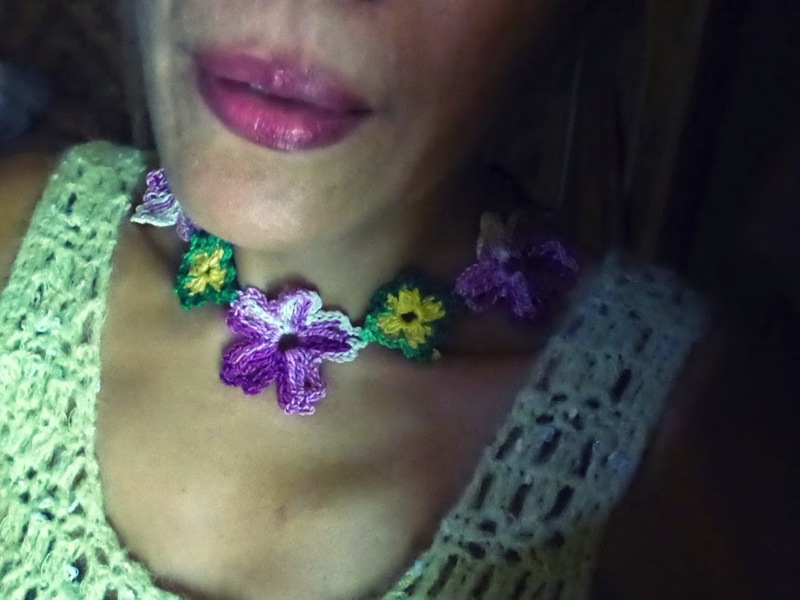 Join green thread to tip of petal with 2 sc, make 70 ch, fasten off. Repeat for other end of necklace. Knot ends of ties.